i-Image is now back up and running and the SSL issue is resolved. This morning we had a problem with the automatic renewal of our SSL certificate, and the site was loading with a warning, so we had to take the site offline until we have resolved the problem. We understand this downtime may have caused you some inconvenience and we will be looking into the reasons behind the certificate renewal failure and looking at what we can do to mitigate this problem in the future. Please be assured however that although the certificate had expired, no data has been compromised and the website wasn’t trying to impersonate or steal any information – this is a warning created by your web browser. Once again we apologies for any worry or inconvenience this may caused. SSL Certificates digitally bind a cryptographic key to an organization’s details. When installed on a web server, it activates the padlock and the https protocol and allows secure connections from a web server to a browser. Typically, SSL is used to secure credit card transactions, data transfer and logins, and more recently is becoming the norm when securing browsing of social media sites. 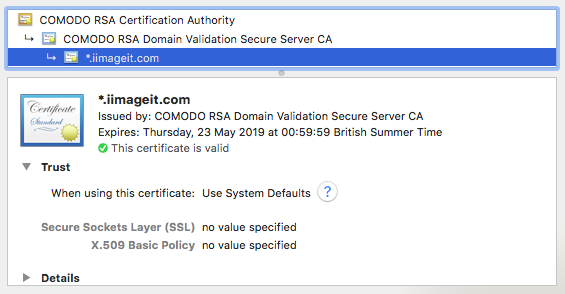 We have a process in place where our web server automatically renews the SSL certificate on a yearly basis, unfortunately this morning the automatic process failed on our server and wouldn’t let us update the certificate manually. We are still looking into the reasons why this has happened. Working with our Hosting provider we have managed to log-in to our server, manually create, update and install the secure cryptographic keys required for SSL to work successfully on our site. Whilst the certificate had expired, the data being sent was still encrypted. However, the endpoint would not have been verified. So, the data is “secure” in that it’s encrypted over the wire. What GDPR means for you?